Mammillaria robustispina A.Schott ex Engelm. 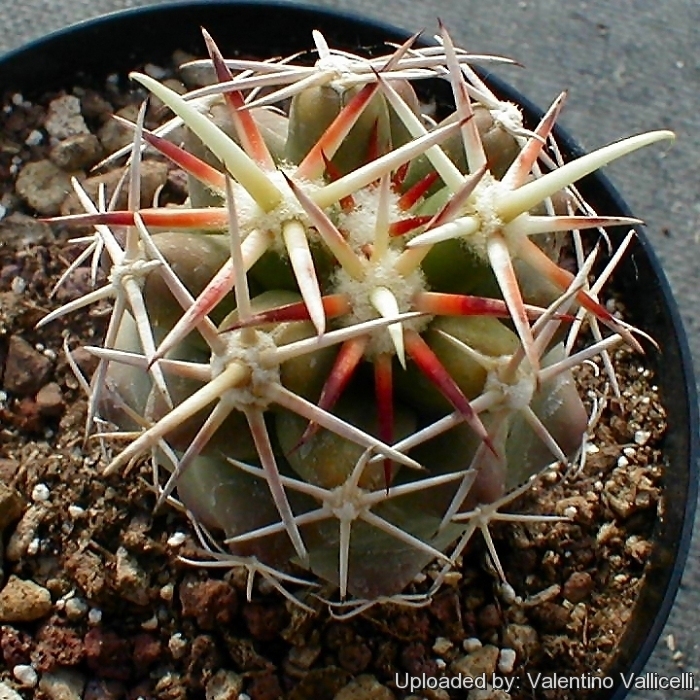 Origin and Habitat: Coryphantha robustispina has a very large extent of occurrence and is distributed in Chihuahua and Sonora in Mexico, and in the United States in Arizona, New Mexico and Texas. Altitude range: It grows at elevations from 700 to 1,500 metres above sea level. Habitat and Ecology: This species grows in xerophyllous scrub and grasslands on sandy substrates, alluvial fans, and gravelly soils. Although it is relatively scarce and there are threats in places, these are not sufficient to warrant concern. The species was much sought after by collectors, however this practice has diminished. 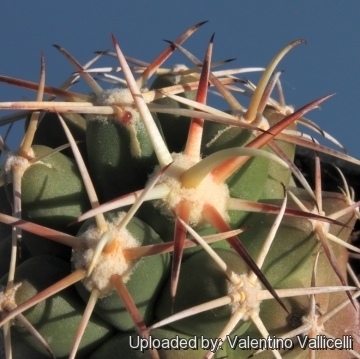 Mining for sand and gravel affects the subpopulations of Coryphantha robustispina in Mexico. 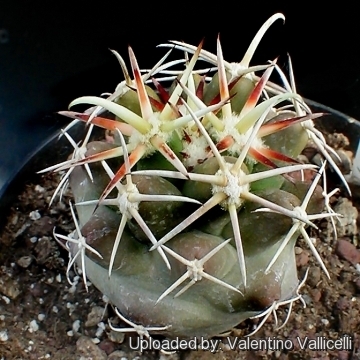 Mammillaria scheeri var. valida Engelm. 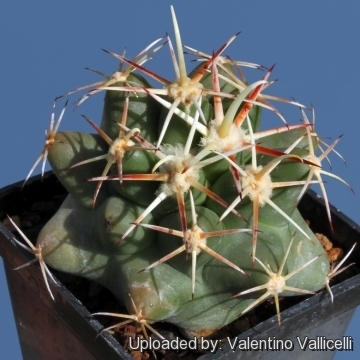 Description: Coriphantha robustispina is a heavily spined, imposing species, and reminds one of an Echinocactus. Stem: Globular, to short cylindrical, solitary. 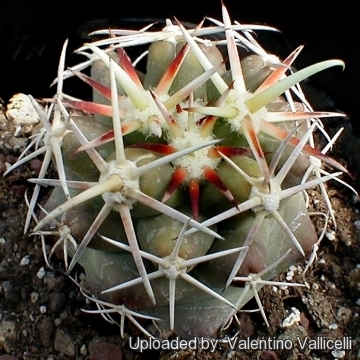 Coryphantha robustispina (A.Schott ex Engelm.) Britton & Rose: (Subsp. robustispina) is typically larger and has a single curved or hooked central spine. Distribution: Arizona. Coryphantha robustispina subs. uncinata (L.D.Benson) N.P.Taylor: has strongly curved or hooked central spines. Distribution (Arizona, New Mexico, west Texas) and Mexico (Chihuahua). Coryphantha scheeri var. valida (Engelm.) L.D.Benson in L.D.Benson: this is the New Mexican form of Coryphantha robustispina subs. scheeri. It is not enough distinct to delineate a variety or subspecies. 6) Heil, K. & Corral-Díaz, R. 2013. Coryphantha robustispina. The IUCN Red List of Threatened Species. Version 2014.3. <www.iucnredlist.org>. Downloaded on 23 April 2015. 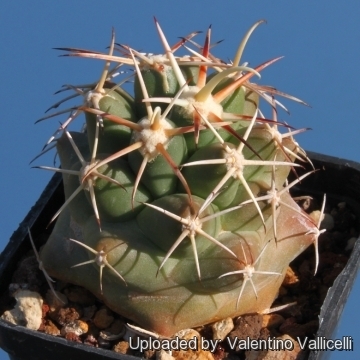 Cultivation and Propagation: This plant grows in the same habitat as Echinocactus horizonthalonius, with which it has some cultivation problems in common: slow-growing, seldom reaching the same size as in nature, sensitive against over-watering. Water sparingly. It needs good drainage. Keep drier in winter. Full sun to partial shade. In humid conditions, the exudation of nectar (if not completely removed by ants) can cause the formation of mould, which leads to ugly black-colouring of the epidermis. To prevent this, spray the plant with water to remove the nectar. And provide very good ventilation.